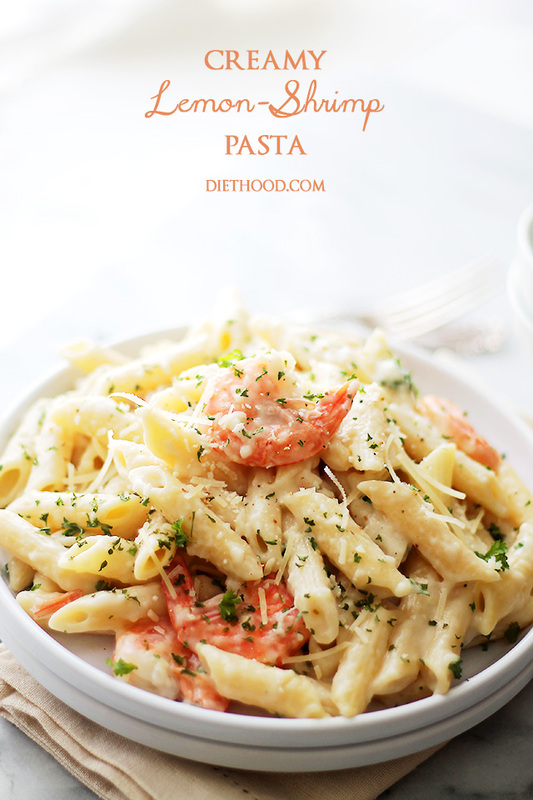 Lightened-Up Shrimp Fettuccine Alfredo – 30-minute, easy, creamy, lightened-up alfredo fettuccine tossed with buttery shrimp and veggies that makes for a quick and absolutely delicious meal. 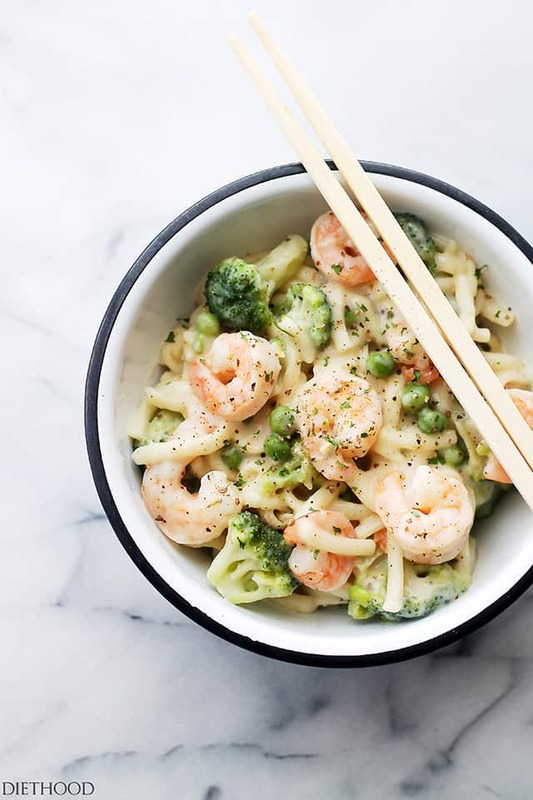 Thus, please join me in forever being a Monday starter and welcome those resolutions with a big bowl of this awesome Lightened-Up Shrimp Fettuccine Alfredo. If you’ve been reading, you know I’m constantly on a quest to recreate and lighten up all restaurant favorites. Recreating Chili’s menu is at the top of the list, but Olive Garden follows a close second because, husband. 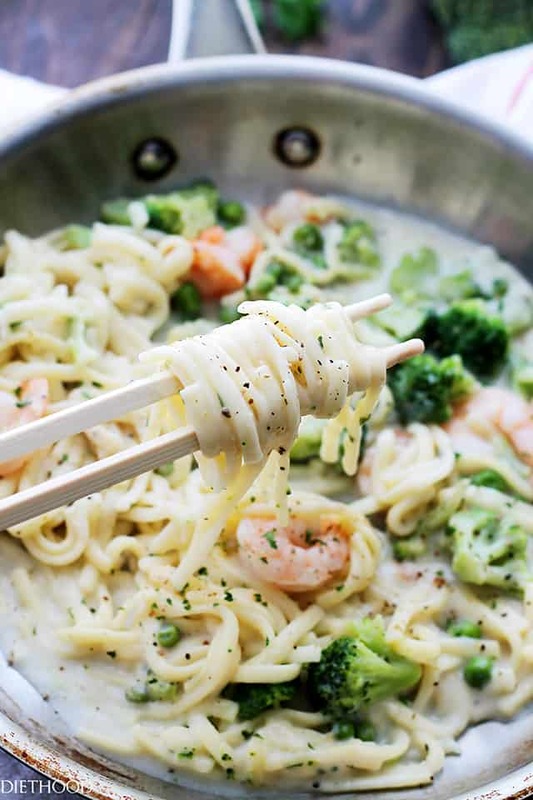 The dude loves the OG so, so much, and their Shrimp Fettuccine Alfredo is ONE of his many faves. P.S. He also worked there years ago just so he could eat all the pasta and breadsticks, all day, every day. Anywho. I single-handedly consumed 2.2 servings of this and that’s not counting the shrimp that I kept picking out of the skillet and straight into my trap. In my defense, they were sitting there, in garlic and butter. I mean, c’mon! You’d do the same. Besides, it’s “lightened-up”. But about the lightened-up bit. 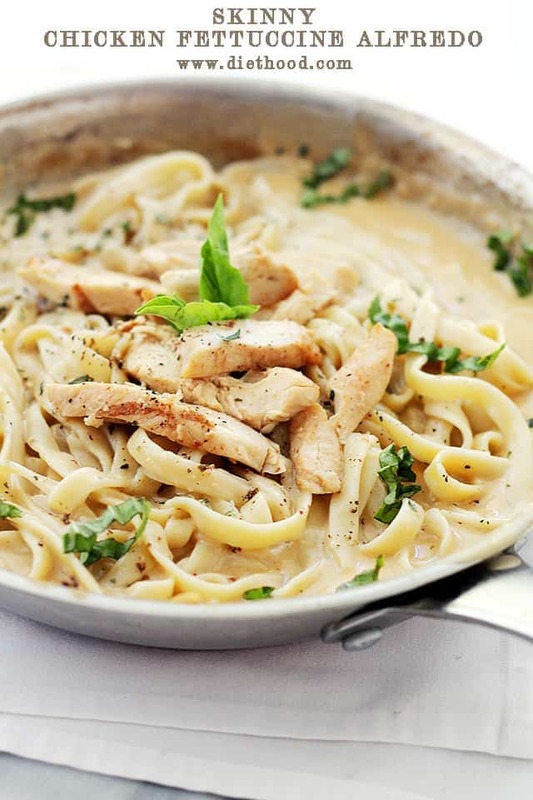 My go-to key for keeping alfredo sauce on the lighter side is leaving out the cream. Some broth and skim milk, plus garlic and parm cheese is all you need. I don’t want to even tell you that this shrimp fettuccine alfredo is SO GOOD!, but I WILL because that’s part of the drill. 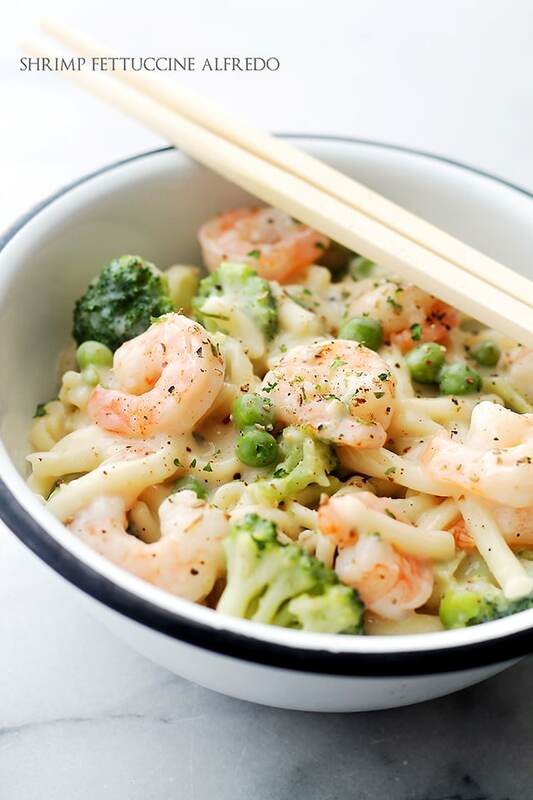 30-minute, easy, creamy, lightened-up alfredo fettuccine tossed with buttery shrimp and veggies that makes for a quick and absolutely delicious meal. Prepare fettuccine pasta according to package directions; add frozen veggies the last 5 minutes of cooking. In the meantime, add butter to a large nonstick skillet and melt over medium-high heat; add half of the minced garlic to butter and cook for a few seconds, or until fragrant. Add shrimp; season with salt and pepper and continue to cook for 2 minutes. Flip the shrimp and cook until fully pink and cooked through, about 2 more minutes. 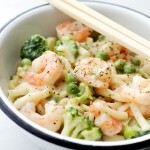 Transfer the shrimp to a bowl and set aside. Add olive oil to the pan and heat it up. Add garlic and saute for about 30 seconds, stirring occasionally, until fragrant. Sprinkle with flour, and stir to combine. Cook for an additional minute to cook the flour, stirring occasionally. Using a whisk, start to slowly add vegetable broth to the pan, whisking to combine until smooth. 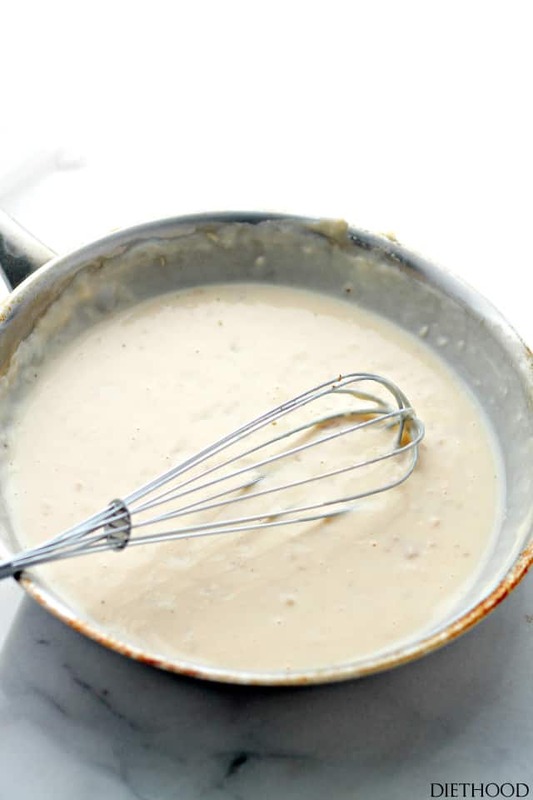 Whisk in milk, and bring the mixture to a simmer. Let cook for an additional minute, or until thickened. Stir in parmesan cheese, salt, and pepper; continue to cook until the cheese melted. Add the shrimp, cooked pasta, and veggies to the sauce; toss well to combine and continue to cook until heated through, about 3 minutes. Remove from heat and let stand couple of minutes. Thank you so much for sharing your recipes. Just beautiful! A family favourite! Do you really have to use vegan butter? Or is that just a way to further reduce calories? That is so funny about your husband! I find myself recreating restaurant favorites a lot as well to either make them lower calorie or gluten free. It’s been especially hard since I was diagnosed with gluten intolerance to eat out. Love it, same great favors, jut not as many calories. I agree, weekend calories don’t exist (or at least they shouldn’t)! 😀 Happy new year! This recipe is calling my name – I love that it’s healthy without being “diet food.” It’s making my mouth water!